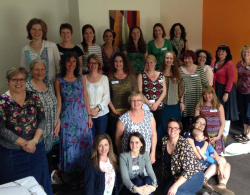 Online Catalogue | Information | Hypnobirthing Practitioner Training | What makes Natal Hypnotherapy different from other hypnotherapy for birth training programmes? Natal Hypnotherapy was developed in the UK by clinical Hypnotherapist Maggie Howell in 2000. The techniques, principles and approach of Natal Hypnotherapy have developed organically through the teachings of some the world's leading natural birth experts including Michel Odent, Ina May Gaskin and Sheila Kitzinger. Maggie Howell created the programme following her own experiences of giving birth five times using Natal Hypnotherapy and from her work and interaction with over two thousand midwives and antenatal teachers across the UK, and having reached well over 150,000 women. Natal Hypnotherapy teaches a woman to fully trust her body, to address, understand and overcome fears, to reframe her beliefs and how to work with her body in the way that is right for her. Natal Hypnotherapy DOES NOT teach women that birth is "pain free", instead it teaches women to accept, welcome and work with the sensations in her body and to understand the causes and reasons behind the sensations she is feeling. The teaching does not imply that if a woman feels pain, then she is not following the techniques correctly or that she is doing something wrong. It does however teach her ways to work with the sensations and ways to "regroup" if she has a particularly strong sensation, for example after waters breaking or a change of location or medical supporter. Natal Hypnotherapy also focuses equally on preparing a woman's birth partner to overcome fears, to fully understand the birth process from a physiological as well as hormonal level and to learn effective ways to help a woman work with her body and to flow with the direction of birthing rather than fight it. However we also prepare women who may not have a partner willing to do the workshop. 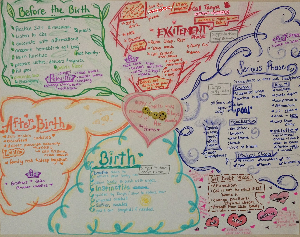 Natal Hypnotherapy teaches a unique, tailored approach so that each couple is empowered to write their own affirmations, birth "mind maps" and to use their own personal imagery and post hypnotic suggestions. This way the couple "own" their birth preparation helping them to have the birth experience that is right for them. In addition the couple learn to use the techniques, not just for the birth but for other times including, perennial massage, back pain during pregnancy and after the baby is born with breastfeeding. The Natal Hypnotherapy classes offer a complete birth preparation course and teaches couples a wide range of comfort measures including massage, positions, visualisation, use of water and use of a birthing ball. The classes teach parents all they need to know to feel prepared and ready for birth. They are no longer frightened about the experience and so find that they enjoy practicing the techniques, take time out to relax, and let go of all the old fears and concerns. At the end of each class, couples leave feeling confident, excited and truly prepared. To find out what our practitioners said about their Natal Hypnotherapy trainining click here.